Rafael González was created in the 1930’s. It was in this brand that the 61⁄2 inch (165mm) by 42 gauge cigar, which has the factory name of Cervantes, was first called a Lonsdale after Lord Lonsdale, the famous English sporting Earl and cigar aficionado of that period. Now many other brands use the name as well. 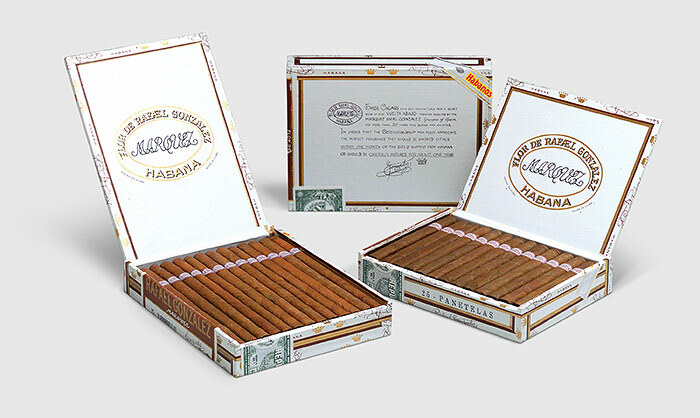 Rafael González cigars contain a light tasting blend of filler and binder leaves from the Vuelta Abajo zone. All sizes are made by the Tripa larga, Totalmente a Mano – long filler, totally hand made technique bar one, which is Tripa Corta, Totalmente a Mano – short filler, totally hand made. The short filler size also incorporates tobacco leaves from the Semi Vuelta zone.